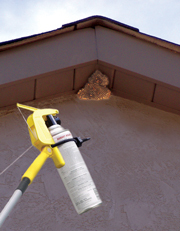 Pest Control Professionals, now you can easily spray those high areas without the need for a ladder. With the Gotcha Sprayer Pro adaptor you can not only spray aerosol cans from the the end of an extension pole, but you can trigger our Powder Duster as well. We also carry complete Professional Spray-N-Dust systems with their own hard sided carrying cases. The system includes a 12ft 3-section extension pole, a Gotcha Sprayer Pro adaptor, a Powder Duster, and an Angled Scraper. All contained in a hard sided padded carrying case. Throw it in the back of your truck and you're ready to go. With a 24' extension pole (purchased separately) you can reach the peaks of virtually any 2 story house or commercial building. The Gotcha Sprayer Pro adaptor can be angled so you can spray under decks without crawling in the dirt or being trapped in close proximity with the wasps and chemicals. 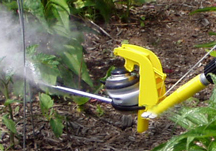 The Gotcha Sprayer attaches to any extension pole with a standard American threaded tip. The aerosol cans are secured using a nylon strap with over 150 pounds of tensile strength. Cans are secured simply by finger tightening the strap.